I was driving home from work the other day and heard this really interesting story on NPR. It got me thinking about my own family’s history and their rise into solid middle class. The original audio of the story is here. The story reflects on the impact that the GI bill of rights had on transforming the middle class. Created in 1944 under the Roosevelt Administration, the GI bill provided returning WWII veterans access to loan programs for homes, education and small businesses. Prior to 1944 home loans were only for the wealthy upper class. In order to qualify for a home loan individuals would need a large downpayment (typically 50%) and the loan repayment terms would be relatively short (think 10 years). Enter the GI bill and the now ‘traditional’ 20% down, 30-year home mortgage. How did the GI bill affect my family? My grandfather Robert Leguillon served in the US Army. In 1946 he returned from service in Alaska to Brooklyn, New York where his wife Frances and their baby Bobby were living at the time. Eventually he decided to move the family West and in 1956 the family relocated to San Francisco. Here he worked as a chef in a number of high profile restaurants. As I’d like to imagine it, Grandma Frances grew weary of the city life and convinced him to move out to the growing suburbs of the East Bay where they could raise their three young and energetic boys. In 1963 my grandparents purchased their first home in San Leandro with assistance from the GI bill. My mom’s father John Ryan also enlisted in the US Army but was soon thereafter medically discharged. In 1950 he and my grandmother Emma purchased their first home in the same East Bay suburb of San Leandro on Timothy Drive. My grandfather had a steady union job as a long shoreman in Oakland’s port. Although they did not use the GI bill to purchase their first home there is no doubt that this bill had a widespread affect on the availability of home loans to those previously shut-out of the home loan market. The ability of my grandparents to purchase their first home allowed them to secure their place within the middle class. So what’s so great about debt? A great point made in the story is how debt does not have to serve as a symbol for extravagence, consumerism, excess and all things bad. This line really resonates with me. It is the essence of the American Dream. In reflecting on all of this it is clear that the GI bill passed some 65 years ago has had a profound impact on the way we live our lives today. I’m not even touching upon the student loan and small business loan programs that were wrapped into the bill (that’s a post for another day). 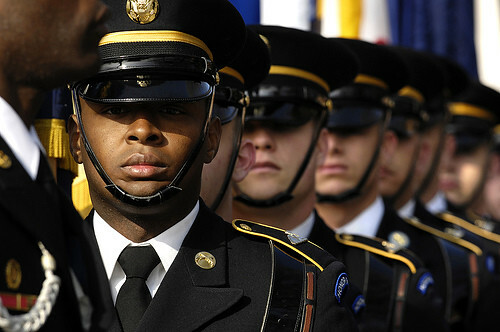 What impacts does the GI bill have on us today? It allowed us to break away from the traditional home lending practices that were in place in the first half of the 20th century. There was a lifting of standards on required downpayments and loan lengths. The lifting of these loan standards in the early 40’s parrallels what has happened in recent years with the ‘new flavors’ of home loans. Loan programs like Adjustable-Rate, Interest Only and even 80/20 loans were certainly not common place ten years ago. The GI bill, along with the super-highway program, led the creation of the modern America suburbs. The home building spree in the 50’s and 60’s created mass amounts of suburban neighborhoods including the one we live in. In fact as I write this I look around our 1963 ranch-style, 1,300 SF home. It’s a charming little home located on a cul-de-sac. Our development is full of homes in which every fourth house looks relatively the same. I can’t help but think about the first family that bought this house in 1963 and wonder how that purchase transformed their life.